After two roles of a liife time (Million Dollar Baby, and Boy's Don't Cry) Hilary Swank has nowhere to go now but down I suppose. One of Swank's next movie will be The Reaping, a biblical horror film coming out this november. This film deals with Swank's character, a former missionary who after the death of her family struggles with God and comes to the conclusion that God does not exist and all his miracles can be explained away in a scientific way. It is for these convictions she gets pulled into a small Louisianna town when it appears that they are experiencing the 10 plagues in their own time. If you watch the preview for this film (linked here) you will see that this film begins to look real ridiculous when the horror element is thrown in with what looks like a small girl playing the child of Satan who appears to be causing the plagues to happen ("Evil has a Savior" is the last thing they say in the preview). Also, this film officially has the worse tagline of any movie I can remember...it's long and incredibly wordy. Do they really need to use the word bizarre? 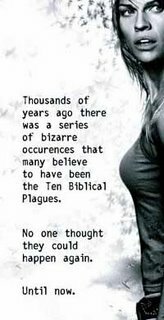 I understand plot-wise why they would say "many believed to have been the Ten Biblical Plauges" but come on, it's a tagline. The film is directed by Stephen Hopkins who directed and produced many episodes in the first season of 24 and the highly acclaimed television film The Life and Death of Peter Sellers. The film is written by Carey Hayes and Chad Hayes the writing team who's most well known credit is the recent horror film House of Wax. Swank has a triple play of film coming out this fall/winter with The Black Dahlia in September, The Reaping in November, and Freedom Writeres in January. First aware of this film and it's tagline from Stale Popcorn. I didn't catch the preview you yet, but I've heard of worse ideas. With that said, horror flicks bore the hell out of me. ALL of them are cheesy. I suppose this is akin to her starring in 'The Core' after 'Boys Don't Cry'. thanks for the visit. I don't watch movies much & I'd definately pass up this one. Nothing says cheesy like mixing the Judeo-Christian tradition with horror movies. I'm a Swank fan. The fact that she was able to hold her own on screen with Pacino in Insomnia really won me over. Nonetheless, this movie looks like garbage. Just seeing the association with the writers behind House of Wax is enough to give me the heebie jeebies. I HATED Million Dollar Baby for it's disingenuous and manipulative final half hour. I'd enjoyed the film quite a bit until the last half hour, which made me feel tricked and scammed. I think that making a couple of crap b-movies is fit punishment for this otherwise fine actress. Didn't they already do the "preacher loses his faith then regains it by fighting monsters" thing in the movie Signs?? Are there no original ideas out there anymore? wasn't this also a movie with theresa russell back in the 90s? or maybe it was even 'the exorcist'. and if she gets another oscar nod for this one i think i'll just walk into the lake. That tagline really is ridiculously stupid. i, for one, find religious themed tv shows and movies boring and hokey. unfortunately, there seems to be a proliferation of them lately. Well, the movie looks like it might be good for a laugh...but not a long laugh, more of a disgusted snort. thousands of years ago: really? like two, three, four? any idea folks? there was a series of bizarre occurences: sure, you could say that. red blood water flowing through the Nile; every first-born dying; that type of bizarre occurences. that many believe to have been the Ten Biblical Plagues: WHAAA??? was there a different set of plagues? were the biblical plagues predicted and the occurences merely confused for those predictions? did someone just screw up royally and mistakenly confuse Ten, the Bible, or Plagues? i don't think the real problem is its length. the problem is it doesn't make a phyookin' lick of sense. like, who the hezekiah would think that something so specific and direct as the Ten Biblical Plagues would reoccur? why should anyone expect that to happen again? who would dare dream such a thing as...? 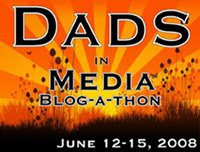 I'll be avoiding this flick.............like the PLAGUE! A long time ago, several bizarre occurences happened that many believe to be the Biblical prophecy of the apocalypse. Turns out that it was just another summer of woefully crappy movies from Hollywood.